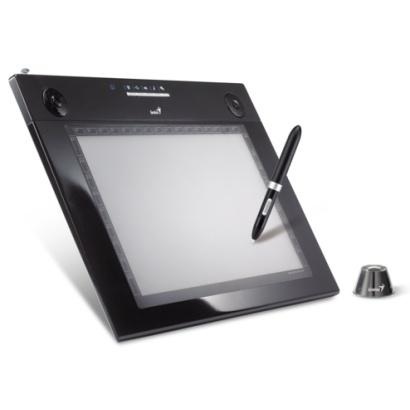 Graphics Tablet is a surface with a pointing device for computer input, usually for graphical works. It receives the information on pen pressure and forwards it to be used by a software. The pen of a Graphics Tablet contains a coil that creates a electromagnetic field generated. Conductor loops in Graphics Tablet tray determines the position by comparing the signal strengths of the induced pin. Additional information such as pen pressure is modulated and sent to the electromagnetic field together with the position data from the Graphics Tablet to the computer. The pins of the pens of the Graphics Tablet are either active pin through a pin-board battery or by induction powered passive pin from the tray of the Graphics Tablet. Many softwares, by default can detect and work with any Graphics Tablet, including Adobe Photoshop, GIMP, Corel Draw, Maya, Blender etc. The control of tools, brushes and similar in graphics applications with a tablet is much more precisely possible with Graphics Tablet than with the mouse. Operation is intuitive, so even people who are not familiar with Graphics Tablet but can draw, can work. Unlike mouse, a Graphics Tablet has absolute coordinates, where each point corresponds approximately to a point on the tablet screen. In many models of Graphics Tablet, the active region is significantly smaller than the total area of ? ?the tablet. This is a big problem of Graphics Tablet. This Article Has Been Shared 3535 Times! Kernel of an operating system kernel belongs to the field of computer science and software engineering and it is the Kernel which build the operating system. Using make Command on OSX to compile application is quite useful as many OS X applications’ source code is distributed as Free Softwares while the dmg are paid. Cite this article as: Abhishek Ghosh, "Graphics Tablet : How a Graphics Tablet Works," in The Customize Windows, May 16, 2012, April 19, 2019, https://thecustomizewindows.com/2012/05/graphics-tablet-how-a-graphics-tablet-works/.